How to survive as the pivot of three regions. In my "Net Assessment of the World," I argued that four major segments of the European and Asian landmass were in crisis: Europe, Russia, the Middle East (from the Levant to Iran) and China. Each crisis was different; each was at a different stage of development. Collectively the crises threatened to destabilize the Eurasian landmass, the Eastern Hemisphere, and potentially generate a global crisis. They do not have to merge into a single crisis to be dangerous. Four simultaneous crises in the center of humanity's geopolitical gravity would be destabilizing by itself. However, if they began to merge and interact, the risks would multiply. Containing each crisis by itself would be a daunting task. Managing crises that were interlocked would press the limits of manageability and even push beyond. These four crises are already interacting to some extent. The crisis of the European Union intersects with the parallel issue of Ukraine and Europe's relation to Russia. The crisis in the Middle East intersects with the European concern over managing immigration as well as balancing relations with Europe's Muslim community. The Russians have been involved in Syria, and appear to have played a significant role in the recent negotiations with Iran. In addition there is a potential intersection in Chechnya and Dagestan. The Russians and Chinese have been advancing discussions about military and economic cooperation. None of these interactions threaten to break down regional boundaries. Indeed, none are particularly serious. Nor is some sort of inter-regional crisis unimaginable. Sitting at the center of these crisis zones is a country that until a few years ago maintained a policy of having no problems with its neighbors. Today, however, Turkey's entire periphery is on fire. There is fighting in Syria and Iraq to the south, fighting to the north in Ukraine and an increasingly tense situation in the Black Sea. To the west, Greece is in deep crisis (along with the EU) and is a historic antagonist of Turkey. The Mediterranean has quieted down, but the Cyprus situation has not been fully resolved and tension with Israel has subsided but not disappeared. Anywhere Turkey looks there are problems. As important, there are three regions of Eurasia that Turkey touches: Europe, the Middle East and the former Soviet Union. I have argued two things in the past. The first was that Turkey was an emerging regional power that would ultimately be the major power in its locale. The second was that this is a region that, ever since the decline and fall of the Ottomans in the first quarter of the 20th century, has been kept stable by outside powers. The decision of the United States to take a secondary role after the destabilization that began with the 2003 invasion of Iraq has left a vacuum Turkey will eventually be forced to fill. But Turkey is not ready to fill that vacuum. That has created a situation in which there is a balancing of power underway, particularly among Turkey, Iran and Saudi Arabia. The most violent and the most immediate crisis for Ankara is the area stretching from the Mediterranean to Iran, and from Turkey to Yemen. The main problem for Turkey is that Syria and Iraq have become contiguous battlegrounds featuring a range of forces, including Sunni, Shiite and Kurdish elements. These battles take place in a cauldron formed by four regional powers: Iran, Saudi Arabia, Israel and Turkey. This quadrangle emerged logically from the mayhem caught between them. Each major power has differing strategic interests. Iran's primary interest is the survival of the establishment and in assuring that an aggressive Sunni polity does not arise in Iraq to replicate the situation Tehran faced with Saddam Hussein. Iran's strategy is to support anti-Sunni forces in the region. This support ranges from bolstering Hezbollah in Lebanon, propping up the minority Alawite establishment in Syria led — for the moment — by Bashar al Assad, and assisting the Iraqi army, itself controlled by Shiites and Iraq's Shiite militias. The United States sees Iran as aligned with American interests for the moment, since both countries oppose the Islamic State and Tehran is important when it comes to containing the militant group. The reality on the ground has made this the most important issue between Iran and the United States, which frames the recent accord on nuclear weapons. Saudi Arabia sees Iran as its primary enemy. Riyadh also views the Islamic State as a threat but at the same time fears that an Iraq and Syria dominated by Iran could present an existential threat to the House of Saud. The Saudis consider events in Yemen from a similar perspective. Also in this context, Riyadh perceives a common interest with Israel in containing Iranian militant proxies as well as the Islamic State. Who exactly the Saudis are supporting in Syria and Iraq is somewhat murky, but the kingdom has no choice but to play a tactical and opportunistic game. The Israelis are in a similar position to the Saudis. They oppose the Iranians, but their main concern must be to make certain that the Hashemites in Jordan don't lose control of the country, opening the door to an Islamic State move on the Jordan River. Jordan appears stable for the moment and Israel and the Saudis see this as a main point of their collaboration. In the meantime, Israel is playing a wait-and-see game with Syria. Al Assad is no friend to the Israelis, but a weak al Assad is better than a strong Islamic State rule. The current situation in Syria suits Israel because a civil war limits immediate threats. But the conflict is itself out of control and the risk is that someone will win. Israel must favor al Assad and that aligns them on some level with Iran, even as Israel works with Sunni players like Saudi Arabia to contain Iranian militant proxies. Ironies abound. It is in this context that the Turks have refused to make a clear commitment, either to traditional allies in the West or to the new potential allies that are yet emerging. Partly this is because no one's commitments — except the Iranians' — are clear and irrevocable, and partly because the Turks don't have to commit unless they want to. They are deeply opposed to the al Assad regime in Syria, and logic would have it that they are supporting the Islamic State, which also opposes the Syrian regime. As I have said before, there are endless rumors in the region that the Turks are favoring and aiding the Islamic State. These are rumors that Turkey has responded to by visibly and seriously cracking down on the Islamic State in recent weeks with significant border activity and widespread raids. The Turks know that the militants, no matter what the currently confrontational relationship might be, could transition from being a primarily Arab platform to being a threat to Turkey. There are some who say that the Turks see the Islamic State as creating the justification for a Turkish intervention in Syria. The weakness of this argument is that there has been ample justification that Ankara has declined, even as its posture toward the Islamic State becomes more aggressive. This shows in Turkey's complex relations with the United States, still formally its major ally. In 2003 the Turks refused to allow U.S. forces to invade Iraq from Turkey. Since then the relationship with the United States has been complex and troubled. The Turks have made U.S. assistance in defeating al Assad a condition for extensive cooperation in Syria. Washington, concerned about an Islamic State government in Syria, and with little confidence in the non-Islamic State militancy as a long-term alternative, has refused to accept this. Therefore, while the Turks are now allowing some use of the NATO air base at Incirlik for operations against the Islamic State, they have not made a general commitment. Nor have they cooperated comprehensively with Sunni Saudi Arabia. The Turkish problem is this: There are no low-risk moves. While Ankara has a large army on paper, it is untried in battle outside of Turkey's 30-year insurgency in its southeast. Turkey has also observed the outcome of U.S. conventional forces intervening in the region and doesn't want to run the same risk. There are domestic considerations as well. Turkey is divided between secular and Islamist factions. The secularists suspect the Islamists of being secretly aligned with radical Islam — and are the source of many of the rumors floating about. The ruling Sunni-dominated Justice and Development Party, better known by its Turkish acronym, AKP, was seriously weakened in the last election. Its ability to launch the only attack it wants — an attack to topple al Assad — would appear to be a religious war to the secularists and would not be welcomed by the party's base, setting in motion rifts that could bring down the AKP. An attack on the Sunnis, however radical, complicates relations with the rebel factions in northern Syria that Turkey is already sponsoring. It also would risk the backlash of reviving anti-Turkish feelings in an adjacent Arab country that remembers Turkish rule only a century ago. Therefore Turkey, while incrementally changing — as evidenced by the recent accord to allow U.S. Predator drones to fly from Incirlik — is constrained if not paralyzed. From a strategic point of view, there appears to be more risk than reward. Its position resembles Israel's: watch, wait and hopefully avoid needing to do anything. From the political point of view, there is no firm base of support for either intervening directly or providing support for American airstrikes. The problem is that the worst-case scenario for Turkey is the creation of an independent Kurdish republic in Syria or Iraq. That would risk lighting a touchpaper among Kurds in southeastern Turkey, and regardless of current agreements, could destabilize everything. This is the one thing that would force Turkey's hand. However, the United States has historically had some measure of influence among the Kurds in Iraq and also in Syria. While this influence can be overstated, and while Washington is dependent on the Kurdish peshmerga militias for ground support as it battles the Islamic State from the air, it is an important factor. If the situation grew out of control, Ankara would expect the United States to control the situation. If Washington could and would, the price would be Turkish support for U.S. operations in the region. The Turks would have to pay that price or risk intervention. That is the lever that would get Ankara involved. The Turks are far less entangled in the Russian crisis than in the Middle East, but they are still involved, and potentially in a way that can pyramid. There are three dimensions to this. The first is the Black Sea and Turkey's role in it. The second is the Bosporus and the third is allowing the United States to operate from its air base in Incirlik in the event of increased Russian military involvement in Ukraine. The crisis in Ukraine necessarily involves the Black Sea. Crimea's Sevastopol is a Russian Base on the Black Sea. In this potential conflict, the Black Sea becomes a vital theater of operations. First, in any movement westward by the Russians, the Black Sea is their right flank. Second, the Black Sea is a vital corridor for trade by the Russians, and an attempt by its enemies to shut down that corridor would have to be addressed by Russian naval forces. Finally, the U.S./NATO strategy in addressing the Ukrainian crisis has been to increase cooperation with Romania. Romania is on the Black Sea and the United States has indicated that it intends to work with Bucharest in strengthening its Black Sea capabilities. Therefore, events in the Black Sea can rapidly escalate under certain circumstances, posing threats to Turkish interests that Ankara cannot ignore. The Black Sea issue is compounded by the question of the Bosporus, which is a narrow strait that, along with the Dardanelles, connects the Black Sea with the Mediterranean. The Bosporus is the only passage from the Black Sea to the Mediterranean. For the Russians, this is a critical trade route and the only means for Russian ships passing into the Mediterranean. In the event of a conflict, the United States and NATO would likely want to send naval forces into the Black Sea to support operations around its perimeter. Under the Montreux Convention, an agreement signed in 1936, the Bosporus is under Turkish control. However the convention also places certain restrictions on traffic in the Bosporus. Access is guaranteed to all commercial traffic, however, Ankara is authorized to refuse transit to countries at war with Turkey. All countries with coasts on the Black Sea are free to operate militarily in the Black Sea. Non-Black Sea nations, however, suffer restrictions. Only warships under 15,000 tones may be sent, and no more than nine at any one time, with a total tonnage of 30,000 tons. And then they are only permitted to stay for 21 days or less. This limits the ability of the United States to project forces into the Black Sea — American carrier battle groups, key components of U.S. naval power, are unable to pass through. Turkey is, under international law, the guarantor of the convention and it has over time expressed a desire to be freed from it so Ankara can exercise complete sovereignty over the Bosporus Straits. But it has also been comforted by knowing that refusal to allow warships to pass can be referred to international law, instead of being Turkish responsibility. However, in the event of a conflict with Russia, that can no longer be discounted: Turkey is a member of NATO. If NATO were to formally participate in such a conflict, Ankara would have to choose whether the Montreaux Convention or its alliance obligations take precedence. The same can be said of air operations out of Incirlik. Does Turkey's relationship with NATO and the United States take precedence or will Ankara use the convention to control conflict in the Black Sea? Even prior to its own involvement in any conflict with Russia, there would be a potentially dangerous diplomatic crisis. To complicate matters, Turkey receives a great deal of oil and natural gas from Russia through the Black Sea. Energy relations shift. There are economic circumstances on which the seller is primarily dependent on the sale, and circumstances on which the buyer is dependent. It depends on the room for maneuver. While oil prices were over $100, Russia had the financial option to stop shipping energy. Under current pricing, Russia's ability to do this has decreased dramatically. During the Ukrainian crisis, using energy cut-offs in Europe would have been a rational response to sanctions. The Russians did not do it because they could not afford the cost. The prior obsession with the fragility of the flow of energy from Russia is no longer there, and Turkey, a major consumer, has reduced its vulnerability, at least during the diplomatic phase. The United States is constructing an alliance system that includes the Baltics, Poland and Romania that is designed to contain any potential Russian advance westward. Turkey is the logical southern anchor for this alliance structure. The Turks have been more involved than is already visible — conducting exercises with the Romanians and Americans in the Black Sea. But as in the Middle East, Ankara has carefully avoided any commitment to the alliance and has remained unclear on its Black Sea Strategy. While the Middle East is more enigmatic, the Russian situation is potentially more dangerous, though Turkish ambiguity remains identical. Similarly, Turkey has long demanded membership in the European Union. Yet Ankara's economic performance over the last 10 years indicates that Turkey has benefitted from not being a member. Nevertheless, the secularists in particular have been adamant about membership because they felt that joining the union would guarantee the secular nature of Turkish society. The AKP has been more ambiguous. The party continues to ask for membership, but it has been quite content to remain outside. It did not want the EU strictures secularists wanted, nor did it want to share in the European economic crisis. 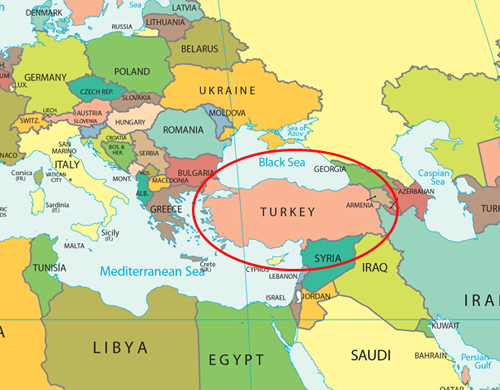 Turkey is nevertheless drawn in two directions. First, Ankara has inevitable economic ties in Europe that are effected by crises, ironically focused on its erstwhile enemy Greece. More important at the moment is the immigration and Islamic terrorism crisis in Europe. Many of the Muslims living in Germany, for example, are Turks and the treatment of overseas Turks is a significant political issue in Turkey. While Ankara has wanted to be part of Europe, neither economic reality nor the treatment of Turks and other Muslims in Europe argue for that relationship. There is a growing breach with Europe in an attempt to avoid absorption of economic problems. However in southeastern Europe discussions of Turkish investments and trade are commonplace. Put into perspective, as Europe fragments, Turkey — a long-term economic power, understanding of what the short-term problems are — draws southeastern Europe into its economic center of gravity. In a way it becomes another force of fragmentation, simply by being an alternate economic benefactor for the poorer countries in the southeast. The potential interaction of Turkey in the Middle East is an immediate question. The mid-term involvement with Russia is a longer question. Its relation to Europe is the longest question. And its relationship with the United States is the single question that intersects all of these. For all these concerns, Turkey has no clear answer. It is following a strategy designed to avoid involvement and maintain maximum options. Ankara relies on a multi-level strategy in which it is formally allied with some powers and quietly open to relations with powers hostile to its allies. This multi-hued doctrine is designed to avoid premature involvement; premature meaning before having achieved a level of strategic maturity and capability that allows it to define itself, with attendant risks. In one sense, Turkish policy parallels American policy. U.S. policies in all three regions are designed to allow the regional balance of power to maintain itself, with Washington involving itself selectively and with limited force. The Turks are paralleling the United States in principle, and with even less exposure. The problem the Turks have is that geography binds them to the role of pivot for three regions. For the United States this role is optional. The Turks cannot make coherent decisions, but they must. So Ankara's strategy is to be consistently ambiguous, an enigma. This will work until outside powers make it impossible to work. George Friedman is founder and chairman of Stratfor, the world's leading global intelligence company. The Turkish Enigma is republished with permission of Stratfor. Copyright © George Friedman . Published by MercatorNet.com. You may download and print extracts from this article for your own personal and non-commercial use only. Contact us if you wish to discuss republication.